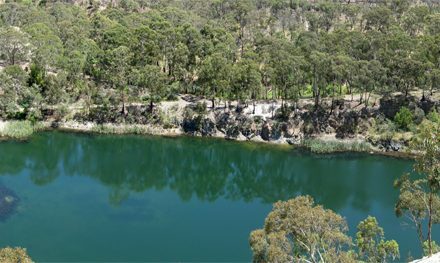 When you live in the inner-city, it’s hard to find truly beautiful natural places that don’t require a huge drive, so when someone told me about Red Bluff in Sandringham (one of Melbourne’s bayside suburbs) I was pretty keen to check it out. On this occasion, my instincts paid off. 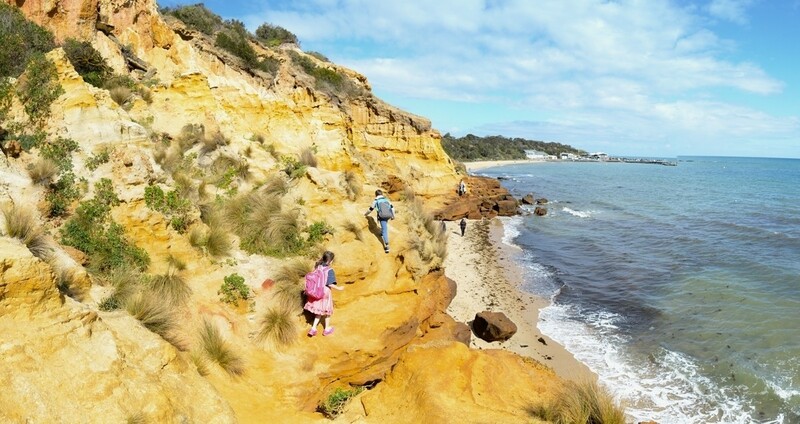 Starting from Picnic Point in Sandringham (near the Sandringham Yacht Club), this walk heads south-east along beaches and rock shelves towards Half Moon Bay. 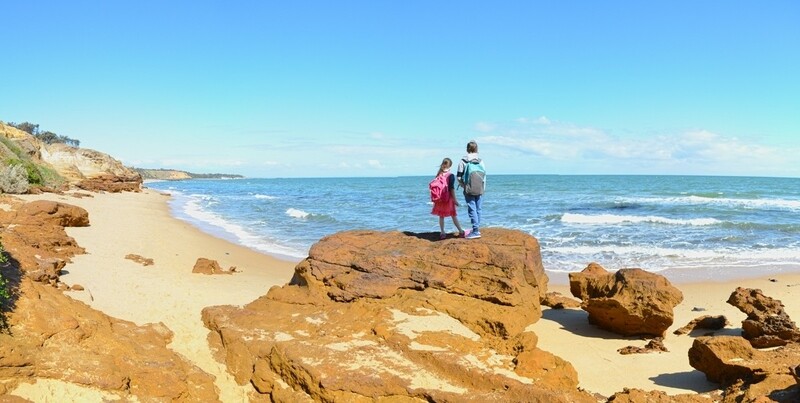 Along the way, you’re treated to incredible geographical features, gorgeous coastal views, and even a shipwreck. 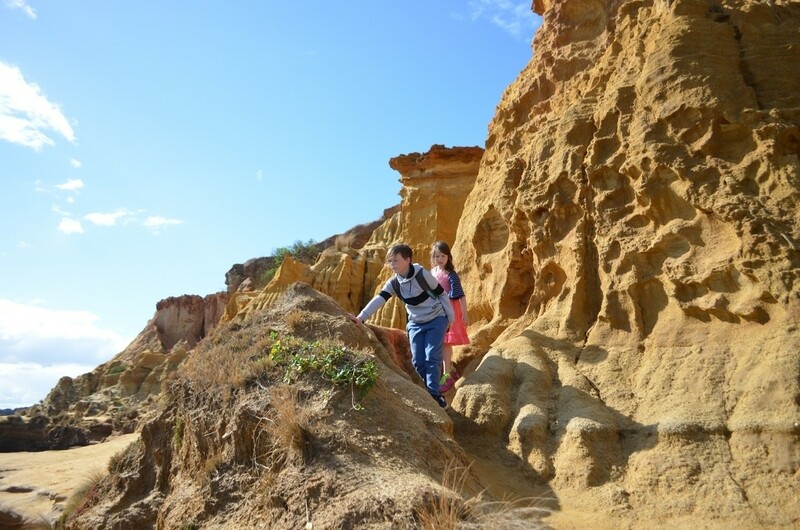 Red Bluff is well worth exploring even if you don’t do the entire hike (you can visit via Half Moon Bay). 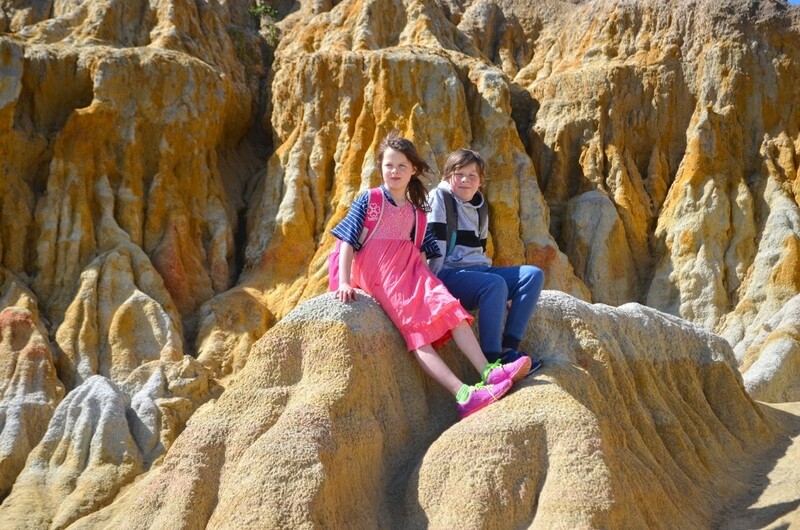 The kids just took to the place, testing their boundaries while they explored the many eroded sandstone crevices and deciding when we needed to turn back and find a safer path. 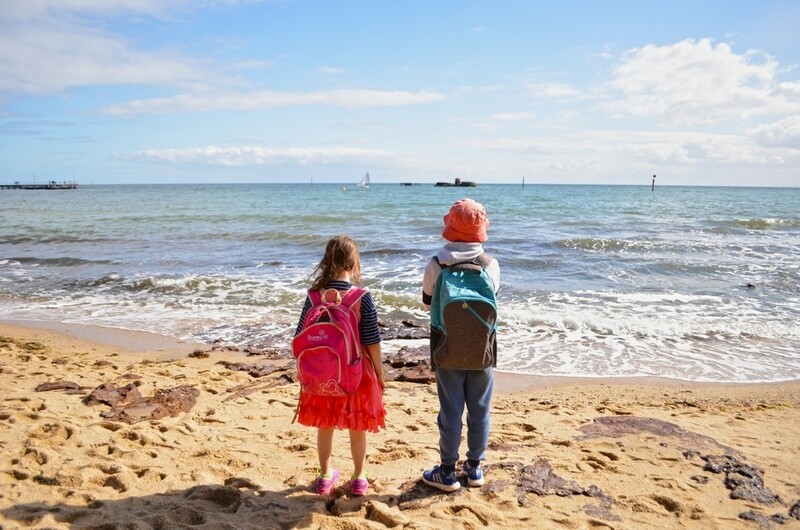 If you’re a particularly anxious parent, you may even find yourself turning back at a couple of points (I nearly did) but we made it work and this always provides the opportunity to push the kids and give them more benefits from the experience. 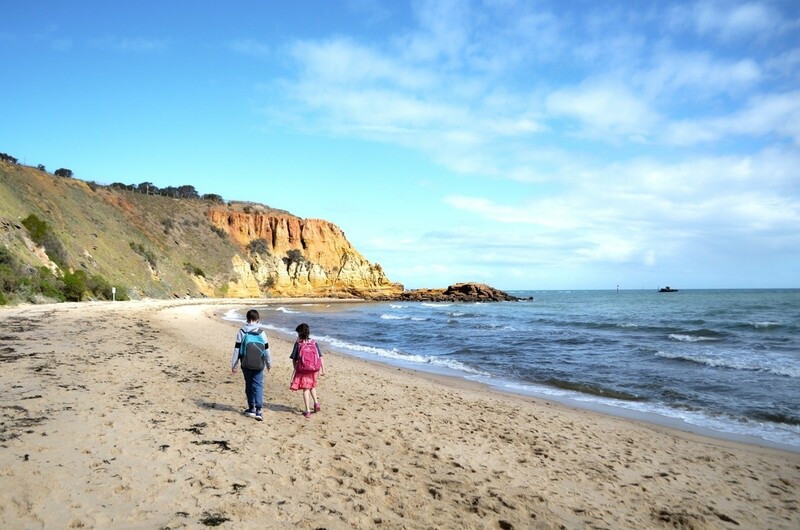 Half Moon Bay is just a short stroll along the beach from Red Bluff, but the beach walking takes its toll even on the young and fit. The best thing is that there’s a guaranteed reward at the exact half-way mark of your day’s walking – lunch. Half Moon Bay is home to Cerberus Beach House, where you can dine in a reasonably well-rated restaurant or buy fairly typical fish’n’chip shop fare from their kiosk. The large chips were much more than the three of us could handle and I ordered a burger which was delicious but not exceptional. If you’re keen to stop for a beer, the surf life-saving club at Half Moon Bay lets you bring your kiosk food. It’s upstairs so I imagine the views are amazing. When you return with a full belly (and perhaps a beer or two under your belt), you’ll be ready for some easier walking, so take the ramp heading up towards Beach Road from Half Moon Bay. 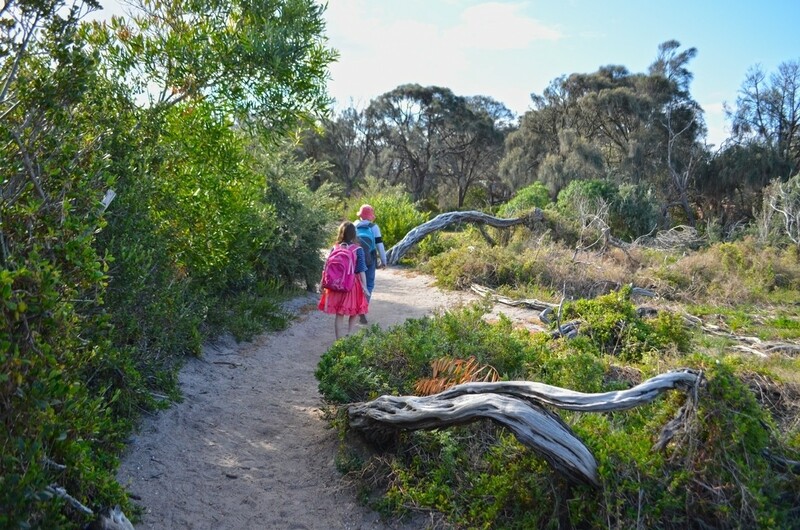 The path back to Picnic Point is a bit of a maze but you can stay off the roadside shared cycling track/footpath if you follow the bush tracks carefully along the clifftops. There are only two very short sections (no more than a few metres) where you have to join the road and find your path again. 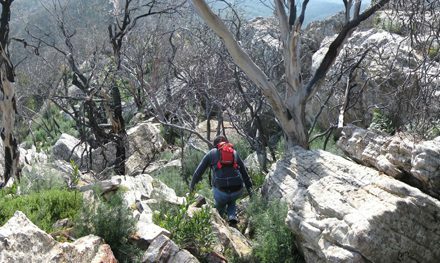 This track along the top of the sea cliffs winds its way through some attractive coastal bushland, thick with twisted ti-trees. There are some lookouts along the way where you can take in the spectacular views. The kidlets loved getting a birdseye view of the path we’d taken before lunch. 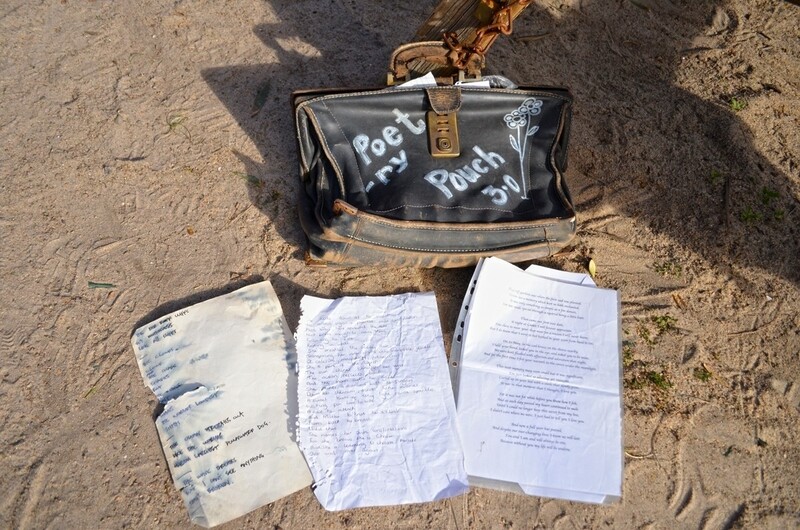 Chained to the leg of a picnic table at one of the lookouts we found a weathered vintage leather briefcase with some writing on it – “Poetry Pouch 3.0”. Inside there were pages and pages of poetry, each page written in a different visitor’s handwriting. There was lots of blank paper and a pen but if there’s one thing a walk with the kids doesn’t leave me feeling it’s creativity, so we enjoyed a few poems, neatly returned them to the case and sealed it up as best we could before moving on. 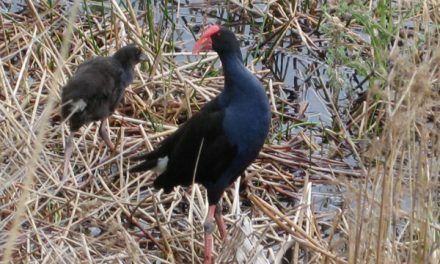 There’s so much here to enjoy and it’s a day out with the kids I’ll definitely be doing again. I’m also looking forward to taking a romantic walk here with my Lori when we get a chance. 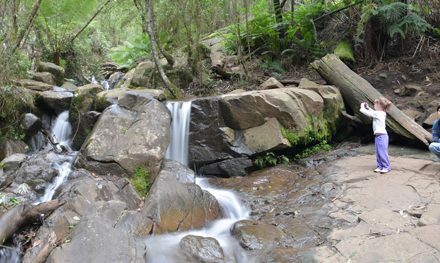 This is one of the most beautiful spots I’ve ever stumbled across in Melbourne. 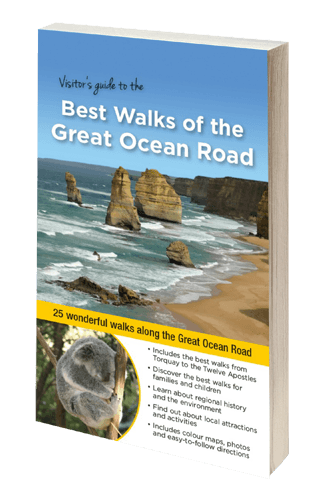 Path Taken: Jetty Road Carpark – ramp to beach near toilet block – walk on the sand, concrete path and then over the rock platforms – Red Bluff – Honeymoon Bay kiosk – ramp to clifftop track – clifftop track – Jetty Road Carpark. Map: No maps available but none is necessary. 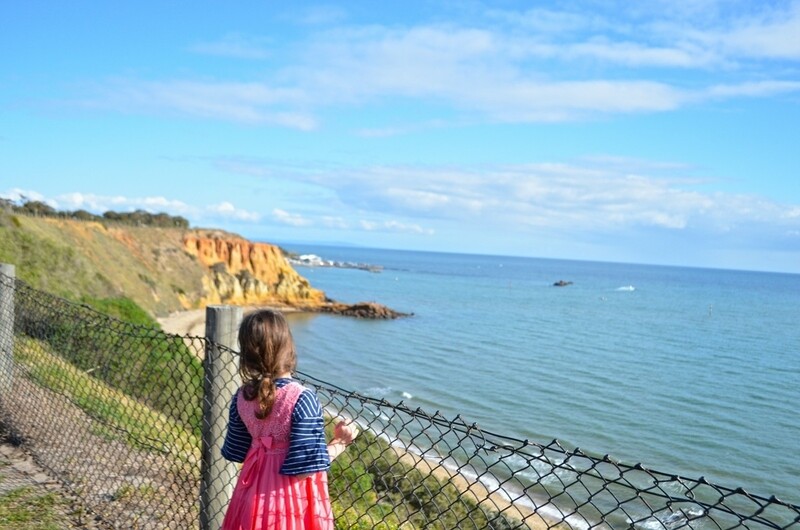 Getting There: From Beach Road in Sandringham, turn west into Jetty Road and park in the first carpark on your left. Walk down the hill to the toilet block where you’ll find a ramp down to the beach, where your walk begins. 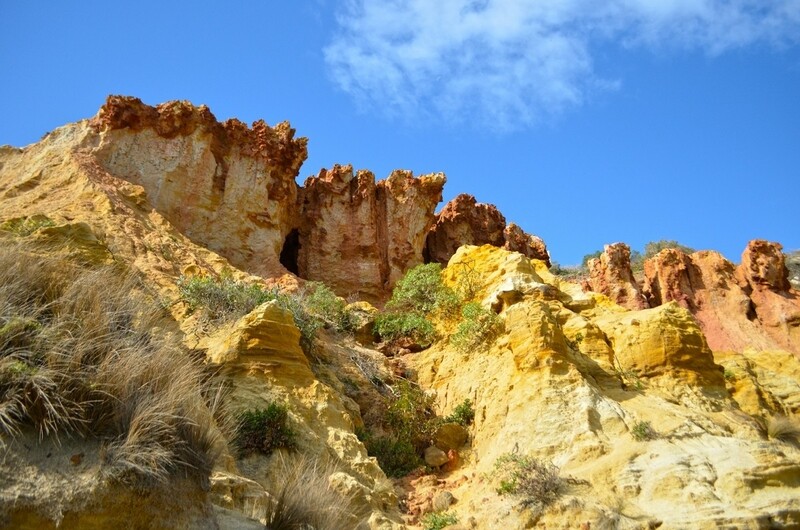 Have you visited Red Bluff in Sandringham? If you have any stories, updates or corrections, please let us know by commenting below.